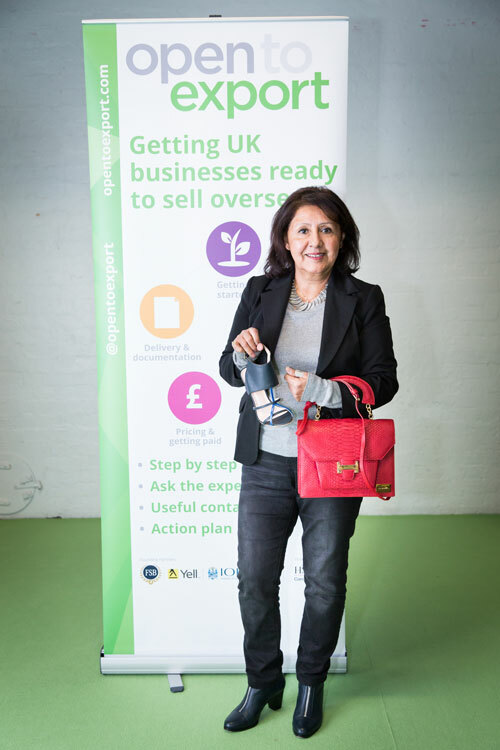 Following another inspiring Export Action Plan final, we’ve asked each of the finalists about their experiences using the tool and for their export tips for future entrants. In this case study we talk to Flora Harrison Ltd.
Flora Harrison with her luxury bags and footwear at the showcase final. How would you describe your business / what do you sell? My Business is a traditional Limited Company, we sell high end ladies shoes and handbags. From the very beginning our vision has been to export our collections. We are going to explore 2-3 market first. Our vision is to open a shop in a chosen market, once we are satisfied with the research we’ve done into it. The Export Action Plan is excellent. It clarifies the different stages of the export process. It will speed up the process allowing us to cut corners and resources. Start your Export Action Plan today and take your next steps towards international growth!